Lilly and Anna, the sister duo behind AfroRetro, will be demonstrating their unique blend of Ugandan textile art and upcycling at Making Uncovered, transforming various materials and fabrics into garments and other items. We combine all the things that we love and are important to us in our accessories, jewellery and fashion range. Our creations are a showcase of all the great ideas, opinions and amazing experiences we have been lucky to have as British Ugandans. We forage in the streets of south London, not only for ideas but to source many of the materials we use to make our ranges from the local community. 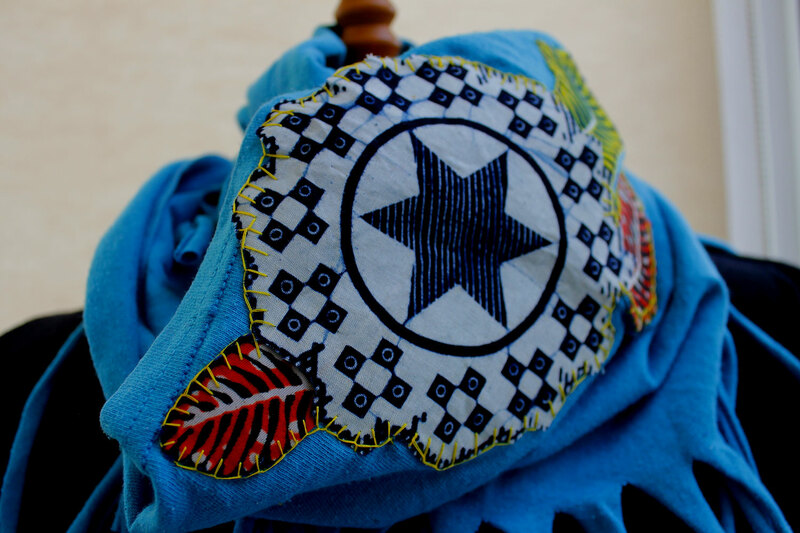 We combine the goodies that you throw out with traditional African materials like banana leaves, Dutch wax and Ugandan bark cloth to make a quirky, hand made, ethical, upcycled range of T-shirts, earrings and snoods. Sometimes words are just not enough. At Making Uncovered we have been given the amazing chance to show people who we are and what we do in our own words and actions. Such an opportunity was too good to miss out! We really wanted to be a part of this creative gathering and meet the people who inspire and drive our work. We will be sharing the making love and unleashing your creative selves in a series of drop-in and timed workshops. You can try your hand at weaving a greeting card, Ugandan style, using traditional African materials, or turning an unloved T-shirt into a fabulous circular scarf. AfroRetro’s Making Uncovered workshops are at midday and 4pm and cost £20 each – book your place here! The price includes materials, but bring along an old T-shirt if you have one – the bigger the better!